Kenyans ran away with two Marathon Gold medals on offer to bring down curtains on the Athletics events on the last day of the XIX Commonwealth Games 2010 Delhi here today. 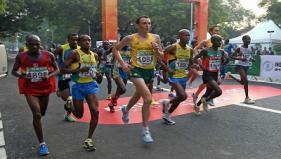 John Eriku Kelai won Gold in the Men's Marathon covering the 42.195km distance in two hours 14 minutes and 35 seconds. "I feel great. I am so humbled to win here. It is an honour," said kelai about winning Gold. "I didn't know I could be the winner. I knew it was going to be tough," he added. Kelai graciously dedicated the Gold to his country and Coach. "I feel on top of the world. This is for my country, the people, coaches and officials. All of us are going to celebrate. When you can win at this level you know you have reached your peak," he said. Australia's Michael Shelly bagged the Silver in 2:15:18 while another Kenyan Amos Tirop Matui pocketed the bronze in 2:15:58. In Women's Marathon, Kenya bagged both the Gold and Silver with Irene Jerotich Kosgei winning the race in two hours 34 minutes and 32 seconds while compatriot Irene Mogake clocked 2:34:43. Kosgei is the second non-Australian to win the Women's Marathon after Canadian Carole ROUILLARD (CAN) in 1994. Australia's Lisa Weightman took the Bronze in 2:35:25. World record holder Englishwoman Paula Radcliffe had pulled out of the Games. Kenya has been the most successful participating nation in Athletics. Kenya has won 11 Gold medals, 10 Silver medals and eight Bronze medals in Athletics, better than Australia's 11 Gold, six Silver and three Bronze. This is the first time that Kenya has been the most successful in Athletics in Games history. This was Kenya's first win in the Women's Marathon.